« University police brutalize peaceful protestors at UC Davis; do students bear some responsibility? 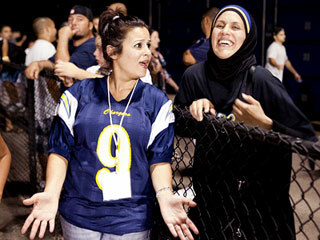 All-American Muslim isn’t fiction; it deals with real issues of real people. They’re all different. Some are religious, some aren’t. Some are recent immigrants; some are as American as the Detroit Tigers or Chevrolet. Once you get to know them you’ll have a tough time pigeonholing Muslims, or treating them as “other”—as people fundamentally different and not as good as us. This entry was posted on November 24, 2011 at 8:45 pm and is filed under Entertainment, Ethics-general, Media, Religion, Tolerance. You can follow any responses to this entry through the RSS 2.0 feed. You can leave a response, or trackback from your own site.